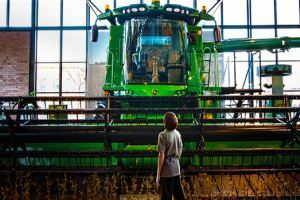 According to a recent news release, the 60th annual Farm Progress Show will take place August 27, 28, and 29 in Decatur, Illinois, showcasing equipment and information provided by more than 600 exhibitors, including the latest from John Deere. This year’s show, which is known as the largest outdoor farm show, is expected to draw a record attendance, including visitors from across 40 different countries who are interested in seeing the latest products from their favorite brands first-hand. The event is typically anchored by a field demonstration, showing machines in action, but this event has been cancelled this year due to late corn planting in the Illinois area. "Despite the best efforts of our host farmers, field demonstration corn planting was delayed due to the wet/cold spring; most of the corn was planted on May 15," said Matt Jungmann, Farm Progress national events manager. To fill this void, the show has organized a Runway Show which will include equipment from John Deere and many more. Companies participating in the show will have an opportunity to talk about their machines in front of crowds. The exhibit field is open to visitors from 8 a.m. to 5 p.m. on Tuesday and Wednesday (27, 28), and 8 a.m. to 4 p.m. on Thursday the 29th. Visitors from around the world will be descending upon Decatur, Illinois, this week to take a look at the latest products and information from their favorite brands, including John Deere. While the field demonstration has been cancelled this season due to late planting, plenty of machinery information will be available during the Runway Show, according to the Farm Progress Show news release.